We know that most of you are not working on highly complex projects. If you were you would of course be using our PRINCE2 or MSP methodologies. So you could tailor PRINCE2 to meet your low complexity challenges, but this isn’t easy. If you tailor each one in turn you spend a lot of time, which is expensive on a small project. You need highly trained and experienced PMs to do this successfully. Even with that you end up losing the great consistency of PRINCE2 as each person will tailor differently. So that is why we created our nStep family of simple project methods. 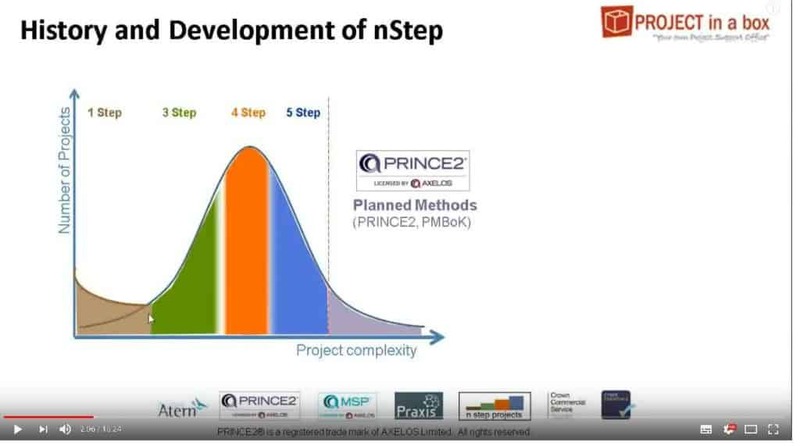 With nStep, rather than simplifying PRINCE2, we have looked at the challenge of simple projects from the bottom up. You may not realise how radical this is but all prior project methodologies have been developed with big projects in mind. Experts have then often slimmed them down for smaller situations. In our experience that can leave them heavy/clunky on small projects. We have taken a different approach. So nStep starts with the simplest of project ideas a start, a delivery and a close. We call this the 3 Step method because… well we think you can work that out. Your 4 Step method assumes multiple delivery cycles so we add a step for managing the change of delivery cycle. Our 5 Step method adds a direction process because more complexity usually required more oversight. We think that these models will handle the majority of the projects you run. If you have more complex projects then use PRINCE2 or Praxis or follow PMBoK. Because with nStep we are thinking simple project methods and small scale this isn’t the end of the story. We also provide a 1 Step approach. You can use 1Step for your myriad of BAU activities. We find customers have many hundreds of these. You still need to manage them but they are too small to be projects. We have been providing nStep methods like this for many years and evolving the content periodically. Our latest versions nStep 2017 were launched in December and you can find out more about them in the video on You Tube. We have set up each method with templates and guidance and a process flow which is easy to follow. We have secured the use of the official PRINCE2 templates from Axelos to include in nStep methods. So your project teams will become accustomed to them early and ready for working on more complex projects later. Because we have pre-scaled these simple project methods you gain consistency project to project with the same process and content each time. You also gain speed of launch with projects created at the touch of a button ready to go. nStep is a standard but for our commercial customers you can make it your own. You can personalise the graphics and content and even add your own steps to the series. Simple project methods which are free to use. In line with our ethos of simple and one click set up we provide them free. All four nStep methods are provided as standard in all our products. If you use the free Community Edition they are there. If you use our commercial packages there is no extra charge for nStep. So you can sign up for Community Edition here and see how you like simple project methods made easy right now.